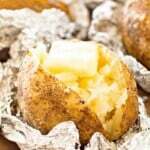 These Baked Potatoes are brushed with butter than seasoned with salt, pepper, and garlic powder. 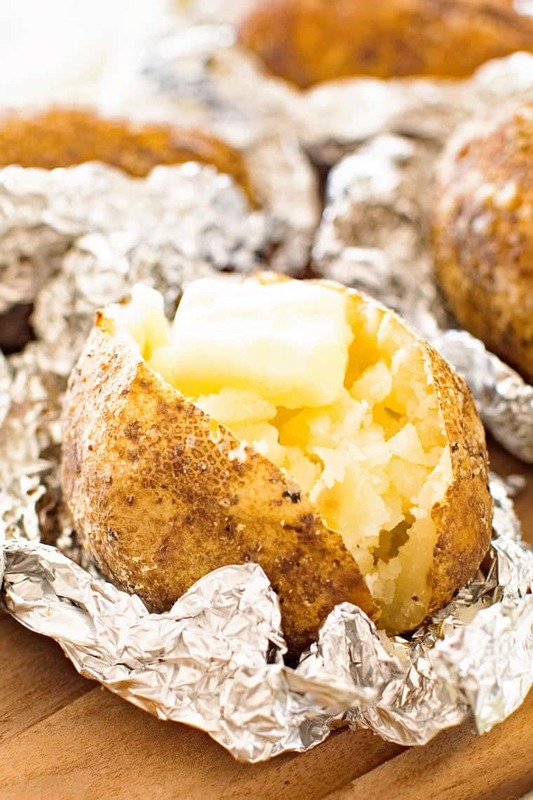 Wrap them in tinfoil and grill them until they are light and fluffy inside! You’ll even eat the skins they are so delicious! Potatoes are pure comfort food, don’t you agree? 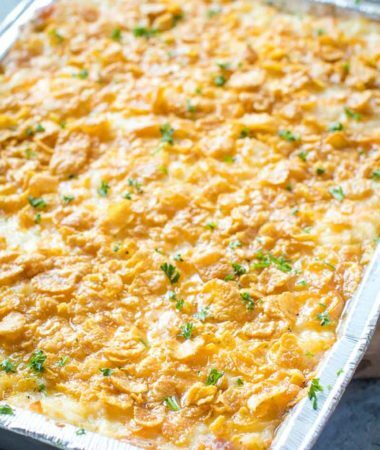 Cheesy Potatoes on the Grill with Bacon – yes bacon or Smoked Baked Potatoes that are perfectly light and fluffy! Now I’m serving up baked potatoes on the grill! 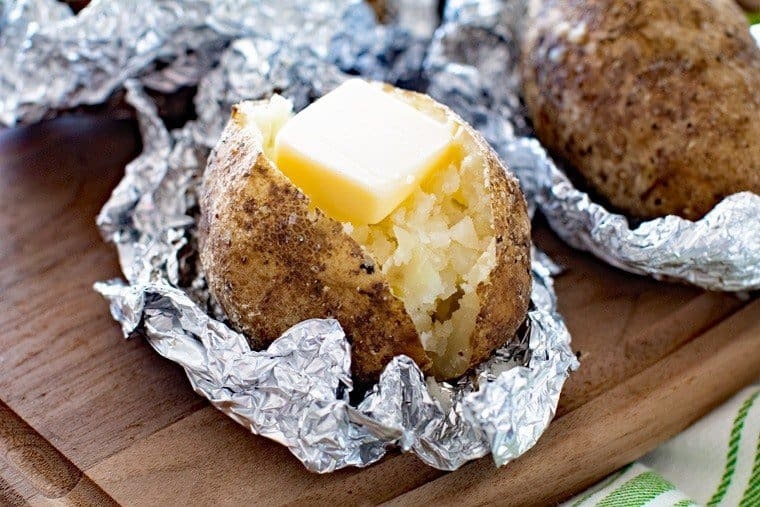 These are everything a baked potato should be! I mean it has BUTTER, garlic, salt and pepper. 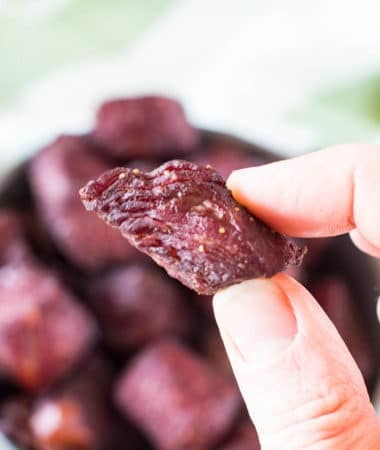 They are so easy and perfect for a grilled side dish. 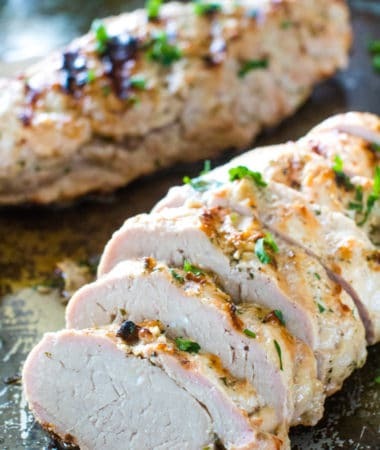 Throw them on the grill while your main dish is on there and you’ll have a full meal in no time at all. They only take 30 minutes! You guys, I got a new grill! It’s amazing, well that is after I figured out how to run it. Picture this. Julie trying to run the new grill while the hubs is at work, slightly panicking because she has a recipe due for a brand and she can’t get the darn thing to turn on! Major panic attack in my life. Usually the hubs grills on the weekends and we tag team the recipes. I love it! I prep, he grills delicious meals like Honey Bourbon Steak, I take photos and then we eat alllll the food. Sounds pretty awesome right? Maybe I can make it so big in the blogging world I can make him stay home all the time and be my assistant. I’m sure he’d just love that. His wife bossing him around. Just kidding! He’d run away. Well, until there was delicious food to eat. 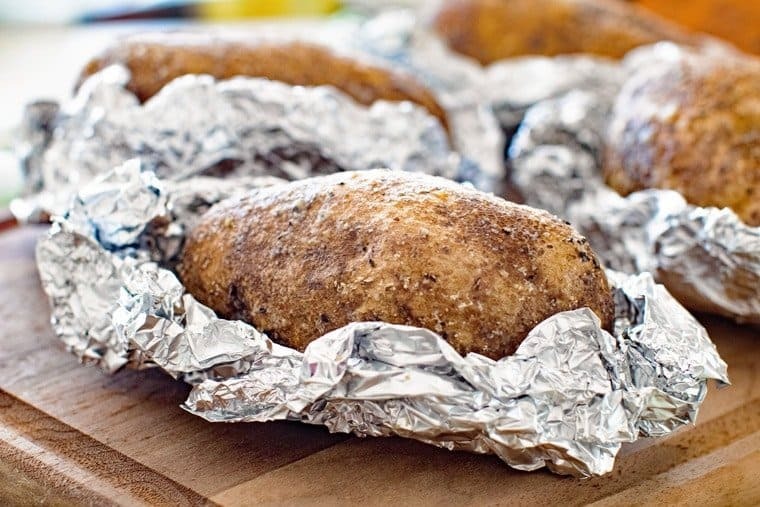 I’m guessing he’d magically reappear like he did when these baked potatoes were ready to eat. Back to the grill fiasco. I was ready to throw it in the dumpster because I couldn’t even get the thing turned on. Thanks to YouTube I finally got it going and about 99 text messages to my husband. He didn’t help for the record. YouTube did. Let’s just say the frustration the first time running it was well worth it. This thing works like a charge. No uneven heating anymore. That means perfectly grilled food. I was a little hesitant on these baked potatoes and was worrying they wouldn’t get done completely or one would be and one wouldn’t. 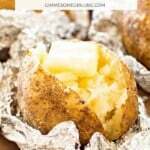 These baked potatoes are so simple! 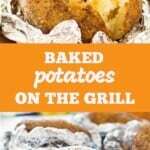 I’m not even that huge of a baked potato love but these will be going on my grilling rotation. First of all you want to make sure you pick evenly sized potatoes so they cook at the same rate. Mine were smaller, but if you pick bigger ones just adjust the grilling time for them. After you pick out your potatoes give them a good wash since you’ll probably be eating the skin because they are so good! After they are washed, pat them dry. Then you want to take your melted butter and brush them all over. Sprinkle your seasonings on them and make sure they are even over the entire potato. After that wrap them in tin foil, twice. Yup, two sheets of foil. Then throw them on the grill for thirty minutes. You’ll want to rotate them a few times to make sure they cook evenly. 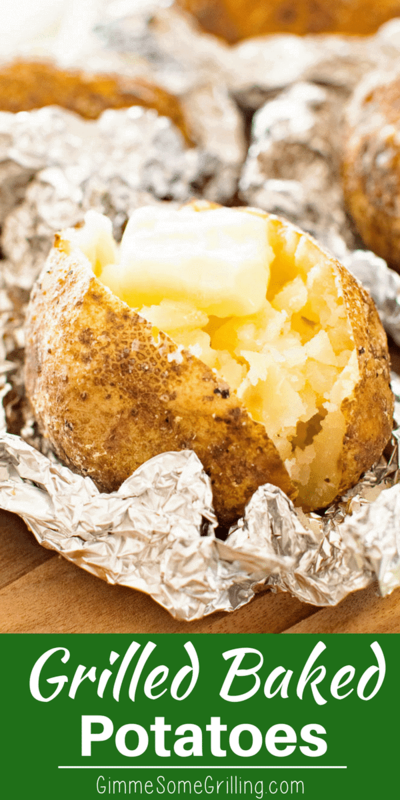 After that, peel off the foil and enjoy! Be careful, they’ll be steaming hot! Tear 8 sheets of foil squares, 12x12 inch, to fold around the potatoes. You will be double wrapping the potatoes. Combine salt, garlic powder and pepper in small bowl. Take one potato and brush the entire potato with butter. Sprinkle with a 1/4 of the seasonings. Spread over entire potato. 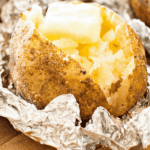 Wrap in a piece of foil and then wrap another one around it. Place on grill for 30 minutes. Turn every 10 minutes. Potatoes are done with they are easily pierced with a fork.